NEW DELHI, Dec 24  Prime Minister Atal Behari Vajpayee today announced a huge cash award of Rs 5 lakh for gold medal winners at the Bangkok Asian Games and Rs 3 lakh and Rs 2 lakh, respectively, for silver and bronze medallists. LONDON, Dec 24  The International Tennis Federations decision not to suspend Australian Open champion Petr Korda for a positive doping test has raised doubts on the federations commitment to a unified programme to combat drugs in sport. DURBAN, Dec 24  West Indies coach Malcolm Marshall and his battered squad head into the third Test against South Africa desperate to avoid yet another hammering. LONDON, Dec 24  Elementary justice was served this year when the new golden league million dollar jackpot was split three ways. MUMBAI, Dec 24  With his second consecutive round of two-under 68, Classic Indian Open winner Feroz Ali caught up with defending champion Mukesh Kumar on top of the leaderboard at the end of the second day of Rs 5 lakh BPGC Open Golf Championship here today. WELLINGTON, Dec 24  India and New Zealand are uneasy going into the 'Boxing day' Test on Saturday without as much as a sparring, with coach Anshuman Gaekwad anxious that his bowlers get their act together from the outset. CALCUTTA, Dec 24  Cricketer Ajit Agarkar today said that he would not be fit before the middle of next month and that his recent injury was caused by playing too much on the hard surface. NEW DELHI, Dec 24  Golden girl Jyotirmoyee Sikdar, who won two gold medals for the country at the just-concluded 13th Asian Games, has been awarded the "most valued performance" award. ROHTAK, Dec 24  Battlelines were drawn for the finals of All India Inter University Boxing Championship on the penultimate day at MDU Sports Complex here today. CHANDIGARH, Dec 24  A 14-member Indo-Cal Club women's hockey team will visit India to participate in the 1999 Surjit Singh Memorial All-India Women's Hockey Tournament to be held next month besides playing a series of games against various teams in the country. JALANDHAR, Dec 24  Punjab Chief Minister Parkash Singh Badal announced here today that the state government would honour the Indian hockey team at a function for winning gold medal in the Bangkok Asian Games. PATIALA, Dec 24  International J.S. Cheema will be the captain of the Punjab men's squad and Amrit Kaur will lead the women's team in the junior powerlifting championships slated to be held at Lucknow from January 4 to 8, according to Mr S.P. Singh, honorary secretary, Punjab Powerlifting Association. JALANDHAR, Dec 24  Defending champions Haryana XI Unique Hockey Club retained the title beating fancied Sukhjit Starch Mill, Phagwara, by 3-2 in an exciting final of the second All India Ramesh Chander Memorial Farmtrac Cup 98 Hockey Tournament for women which concluded at the Olympian Surjit Hockey Stadium here today. CHANDIGARH, Dec 24  Chandigarh senior boys won the gold in rink hockey in the 36th National Roller Skating Championships which concluded at Vishakapatnam recently. NEW DELHI, Dec 24 (PTI)  Prime Minister Atal Behari Vajpayee today announced a huge cash award of Rs 5 lakh for gold medal winners at the Bangkok Asian Games and Rs 3 lakh and Rs 2 lakh, respectively, for silver and bronze medallists. This is significantly higher than the Rs 1 lakh, Rs 75,000 and Rs 50,000 hitherto awarded by the government to medal winners at international competitions. Making the announcement while addressing the Asian Games medal winners who went to meet the Prime Minister at his residence this morning, Vajpayee exhorted Indian sportspersons to "aim bigger" for richer laurels. "We should not become a nation of alp santushti (easily satisfied) and must set our goals much higher," Vajpayee said. The Prime Minister, who received each medallist personally, said the haul of seven gold, 11 silver and 17 bronze medals in Bangkok showed Indian sportspersons were inferior to none and with better infrastructure and training, were capable of touching dizzy heights at the international level. Gold medallists Jyotirmoyee Sikdar, N.G. Dingko Singh, Geet Sethi and Ashok Shandilya, and the entire hockey and kabaddi teams were present at the function. "If we keep climbing the ladder of success, one day we will be able to rub shoulders with the top countries, who are well ahead of us today", he said. 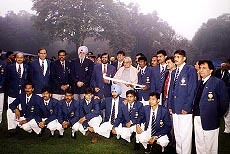 Lauding the mens hockey team for winning the gold after 32 years, Vajpayee, in a nostalgic note, recalled his own college days, when he was a member of the B team. Referring to middle-distance star Jyotirmoyee Sikdar, who claimed a golden double and won a silver, he said she had "lit the jyoti (flame)" of hope which should motivate women athletes to do much better in the coming years. Congratulating bantamweight pugilist Dingko Singh, who won Indias first boxing gold since the 1982 New Delhi games in a triumph over adversity after being denied government clearance, Vajpayee said the 20-year-old Manipur lad had to face many odds, but with a will to succeed he got India the gold. On the kabaddi team which completed a hattrick of gold medal victories at the games, the Prime Minister hoped the continued success would help further popularise this very Indian game. The Prime Minster later posed for photographs with members of each discipline before adjourning for tea with the contingent. Hockey team skipper Dhanraj Pillay presented the Prime Minister with a bouquet and a hockey stick autographed by all members and officials of the gold medal-winning squad. Indian Olympic Association president Suresh Kalmadi presented the Prime Minister with a replica of the Bangkok Games mascot "chai-yo", the smiling elephant. Kalmadi requested the Prime Minister to enhance the allocation for sports in the union budget while announcing that IOA was taking steps to formulate short-term (four-year) and long-term plans to further boost sports performances. He also informed the Prime Minister of New Delhi hosting the inaugural Afro-Asian Games to be held in 2001 and the bid to host the 2006 Asian Games. All the medal winners barring pistol shooter Jaspal Rana and two of the three-member trap team, Zorawar Singh and Manavjit Singh, were present at the function. The increased cash awards would also benefit the winning mens and womens hockey squads and the kabaddi team. The hockey heroes will be sharing a huge sum of Rs 20 lakh while team medal winners in other disciplines will also be given proportionately higher amounts. "We are happy with the amount announced by the Prime Minister, but they can always be higher," said hockey captain Dhanraj Pillay. Kalmadi said he would make a plea to give the enhanced sums to medal winners in the September Commonwealth Games too. Jyotirmoyee Sikdar and Dingko Singh were the stars of the function for their brilliant performances while cueists Ashok Shandilya and Geet Sethi also came in for much attention. The Chef de Mission to the Games G.S. Mander, Indian Hockey Federation President K.P.S. Gill and president of the Indian womens hockey federation, Vidya Stokes, were among those present. The Indian Hockey Federation honoured its heroes who won for the country the Asian Games hockey gold after 32 years. To show its appreciation and gratitude, IHF presented to the 16 players, the two coaches and manager drafts for Rs 1 lakh each at a specially got up function at the Taj Palace here. "We are giving them drafts today as there instances of the cheques we had given earlier bouncing," IHF President K.P.S. Gill quipped while presenting the cheques. Gill said the team doctor Rajiv Ahuja would also be presented a draft for the same amount soon. He said every member of the team, including the two coaches and the manager, deserved congratulations for their tremendous achievement. "They showed mental toughness, particularly in the final where they beat the Koreans at their own game, of fast hockey," he said. According to the IHF chief, the victory at Bangkok had raised the expectations of the people. "I think the country expects us to come back with a medal in the Sydney Olympic games two years from now. We shall do our best". Expressing opinion that the awards and honours to the hockey players were well deserved, Gill said the Punjab Hockey Association was getting up one felicitation programme and hoped the other state units would follow suit. LONDON, Dec 24 (AP)  The International Tennis Federations decision not to suspend Australian Open champion Petr Korda for a positive doping test has raised doubts on the federations commitment to a unified programme to combat drugs in sport. However, ITF communications manager Alun James said yesterday the ITF was not taking a soft stance on drugs and would be an active participant in the International Olympic Committees drug summit in February. James said the ITF had pursued Kordas case vigorously and had followed procedure by allowing its independent appeals committee to rule on his punishment. Korda tested positive to the steroid nandrolone after the quarterfinals at this years Wimbledon championships but he later appealed, claiming he did not know how the drug got into his system. The ITF did not make Kordas positive test public until Tuesday, when the appeals committee announced it had accepted Kordas claim and had decided not to impose a ban. Instead, the 30-year-old Czech was stripped of 199 rankings points and $94,529 prize money he earned at Wimbledon. However, James admitted the ITF "needs to evaluate its drugs programme" in the wake of recent criticism and the IOCs push for harmonious programmes for all federations. James said he couldnt comment on punishments in other sports but agreed there was a growing consensus that athletes should be held fully accountable for themselves in doping tests. "(The ITF) approves of a unified drug programme but we believe there is a case for sports to have individual policies (at the IOC summit) well support a harmonious programme with certain provisions." James said the ITF was bound to support the findings of its independent appeals committee but we need to evaluate (the programme) after whats happened." "The committee comprises legal, medical and technical experts," he said. "It is a transparent programme in the hands of experts and, if the committee decides on a punishment after hearing all the evidence and taking into account mitigating circumstances, then that decision is final." James said the ITF had not kept Kordas positive doping tests a secret. "Unlike a lot of other sports, we dont make results of drugs tests public after A and B samples have been analysed. We wait until the whole process is complete," he said. Tennis is very keen on confidentiality... so the players remain innocent until proven guilty." Korda issued a statement on Tuesday saying he had made exhaustive but unsuccessful attempts to find the source of the illegal substance. I wish to state categorically that I am not a drugs cheat and would never seek to obtain a competitive advantage over my fellow professionals by such means," Korda said. "This allegation came as a tremendous shock and caused considerable distress to me and my family," said Korda. "From a professional standpoint my performances since August suffered, as my recent results have shown. "Whilst I am in the final stages of my career I still love the game. I am delighted that the committee has cleared my name and that I am free to carry on playing and competing." LONDON, Dec 24 (Reuters)  Elementary justice was served this year when the new golden league million dollar jackpot was split three ways. Haile Gebrselassie, Gicham El Guerrouj and Marion Jones each enjoyed outstanding seasons and, appropriately, shared the prize money awarded to athletes winning each of their events in the new series. Gebrselassie, the tiny Ethiopian with the huge stride, would have been most peoples choice as the athlete of the season. He began 1998 in style with world indoor records in the 2,000 and 3,000 metres. After returning to Africa for altitude training, he reclaimed his world 5,000 and 10,000 records during an unbeaten outdoor season. With Daniel Komen in temporary decline, Gebrselassie was unchallenged over the longer distances and now plans to emulate Miruts Yifter with a 5,000-10,000 double for Ethiopia at the 2000 Sydney Olympics. El Guerrouj continued the Muslim hegemony in the 1,500, following Said Aouita and Noureddine Morceli into the record books as the world 1,500 metres record holder. The 23-year-old Moroccan took 1.37 seconds from Morcelis world mark on a perfect Rome evening, reducing the record to three minutes 26 seconds. "Before there was Said Aouita, then Morceli, now its the hour of Hicham," El Guerrouj said. "Now I believe only the clock can beat me." Marion Jones emerged with perfect timing for herself and the sport in the United States as the true heir to Carl Lewis. She lost only once in a long and arduous season, succumbing in the long jump to Heike Drechsler in pouring rain at the Johannesburg World Cup. On the first two days of the three-day high altitude meeting, Jones moved behind Florence Griffith Joyner in the all-time lists for both the 100 and 200. She believes she can break Griffith Joyners world records set 10 years ago and has already staked her claim to become the athlete of the 2000 Sydney Olympics by announcing a target of five gold medals. "Im bubbling with excitement when I say I cant wait for the year 2000 to come around," she said. Jones only challenger as the women athlete of the year was Sonia OSullivan, who had endured a miserable two years since winning world 5,000 title in Gothenburg three years ago. The Irishwoman returned in style on an artificial oasis at the World Cross Country Championships in Marrakech. As vultures circled overhead and camels watched with haughty indifference, OSullivan won both the long and short-course titles. Then, in the outdoor season, OSullivan completed a 5,000-10,000 double at the Budapest European Championships. Budapest marked a revival in British fortunes less than a year after their national federation had gone bankrupt. Britain topped the medals table with nine golds while Drechsler won her fourth successive title. The German won the long jump title at the first World Championship in Helsinki 15 years ago and is still going strong at the age of 34. World 100 metres champion Maurice Greene confirmed to his own satisfaction that he is the worlds fastest man by beating Canadas Olympic champion Donovan Bailey at the New York Goodwill Games. The games also featured a final appearance by the greatest heptathlete of all time in Jackie Joyner-Kersee while Michael Johnson, who otherwise had a low-key season, anchored the US team to a world record in the 4 x 400 metres relay. Joyner lost her sister-in-law in September when Florence Griffith Joyner, who won three gold medals at the 1988 Seoul Olympics, died at the age of 38. In the same week, Ben Johnson, now 36, was refused reinstatement to the sport a decade after testing positive for steroids in Seoul. At years end, Johnson was reduced to running against horses and a racing car as he awaited the result of his latest appeal. DURBAN, Dec 24 (Reuters)  West Indies coach Malcolm Marshall and his battered squad head into the third Test against South Africa desperate to avoid yet another hammering. "Its crunch time, we know we cannot lose this one," said Marshall ahead of Saturdays start against supremely confident opponents. Marshall has his work cut out  raising a team demoralised by defeats in the first two Tests of the five-match series  the second with more than two days to spare. West Indies are short on cricket after their weather-ruined four-day game against South Africa A in Pietermaritzburg ended prematurely. In fact, it was their only action between the second and third Tests. "Any preparation is better than no preparation at all," Marshall said. "Unfortunately the weather has not been the best. But we got a fair amount of cricket out of the game. "The two big plusses for me were Shivnarine Chanderpaul and Junior Murray." Chanderpaul scored 182 in the first innings to confirm himself as the West Indies batsman in the best form of the tour, while reserve wicketkeeper Murray was tidy with the gloves and made a significant 45 in the first innings. Murray was competent enough with the bat to spark speculation that he might be a solution to the tourists inadequate batting if he was picked at number six, even though wicketkeeping duties would still belong to Ridley Jacobs. Conversely, some consider that picking Murray on that basis would be an admission of defeat, instead, Darren Ganga could make his Test debut. The 19-year-old Trinidadian has scored 131 runs at an average of 32.75 with a top score of 50 on tour so far. Another problem area is at number three. Carl Hooper and Chanderpaul are the leading candidates as present incumbent, captain Brian Lara, is likely to drop to number four or even five to make the most of his stroke-playing talent. West Indies also have to decide whether to play four pacemen and rely on part-time off-spinner Hooper for their slow bowling, or to include leg-spinner Rawl Lewis. Kingsmead is traditionally one of the countrys more seam-friendly surfaces but the fact that South Africa lead 2-0 may prompt a more docile pitch. The one nugget of good news for West Indies was that opener Philo Wallace, who missed the second Test with glandular fever was expected to be fit. The South Africans are determined not to ease the pressure with a series victory within reach. "Its going well but we cant afford to get complacent at this stage," said vice-captain Shaun Pollock. "The West Indies are not playing well at the moment but they are so unpredictable. A few sparkling performances and they can turn a series on its head, so although things have gone well for us so far were very wary of them." The only possible change to the South African line-up concerns the spinners berth, where off-spinner Pat Symcox is the man in possession with left-arm wrist spinner Paul Adams out in the cold. Symcox, a defensive rather than an attacking bowler, also offers significant batting ability and is likely to remain on duty. South Africa: Gary Kirsten, Herschelle Gibbs, Jacques Kallis, Daryll Cullinan, Hansie Cronje (captain), Jonty Rhodes, Shaun Pollock, Mark Boucher, Pat Symcox, Allan Donald, Paul Adams, David Terbrugge. West Indies: Clayton Lambert, Philo Wallace, Brian Lara (captain), Shivnarine Chanderpaul, Carl Hooper, Stuart Williams, Darren Ganga, Floyd Reifer, Ridley Jacobs, Nixon Mclean, Rawl Lewis, Curtly Ambrose, Courtney Walsh, Mervyn Dillon, Franklyn Rose, Junior Murray. MUMBAI, Dec 24 (PTI)  With his second consecutive round of two-under 68, Classic Indian Open winner Feroz Ali caught up with defending champion Mukesh Kumar on top of the leaderboard at the end of the second day of Rs 5 lakh BPGC Open Golf Championship here today. The leaders were at four-under 136 for the first two rounds. One stroke behind was Delhis Pappan, who shot a 68 today, while Calcuttas Rafiq Ali, with the days best round of three-under 67, and Vishal Singh of Jaipur moved up to joint fourth place at two-under 138. Last seasons Mahindra Player of the Year, Vijay Kumar, playing with a stiff neck which is causing him trouble, was sixth at level-par 140, while a crowd of seven, including twice Indian Open champion Ali Sher and twice Honda-SIEL PGA winner Uttam Singh Mundy, were sharing the seventh position at one-over 141. The cut was applied at nine-over 149 and as many as 45 pros made it to the third round. Feroz was not elated with this performance despite catching up with the leader. "I had as many as seven birdies today but messed it up with five bogies. After hitting seven birdie, you should at least have a five-under score", he rued later. After making the turn at two-under, Feroz had horrendous back nine. Despite four birdies, he made four bogies and just one par. He exploited the par-5s nicely as he made birdies on all four. Ferozs younger brother Rafiq was also in good form except for a stretch between the 6th and 8th hole. After starting with an eagle on the first when his driver, followed by a 3-iron shot left him with a 10-footer putt. Rafiq birdied the par-5 4th as well. He then three-putted from the edge of the green on the 6th and the 7th holes, and then missed his chip-putt on the 8th for three consecutive bogies. Pappan, who had a one-under 69 round yesterday, moved up with a 68 today after a round which included some of his trademark huge putts. On the 8th hole, he sunk a 20-footer from outside the green, while on the 12th, a curling putt travelled 35 feet before dropping into the cup. Amateurs: 158-Amit Nigam (78+80); 160-Rohit Goyal (81+79); 170-Lalit Goenka (87-83). WELLINGTON, Dec 24 (PTI)  India and New Zealand are uneasy going into the 'Boxing day' Test on Saturday without as much as a sparring, with coach Anshuman Gaekwad anxious that his bowlers get their act together from the outset. Feeling the lack of sufficient practice in the longer version of the game with the weather having played spoilsport on the tour, the Indians had a drawn-out session this morning. Gaekwad was busy correcting the line of the support bowlers during the nets. Not for the first time on this tour, he took aside Harbhajan Singh and Debasish Mohanty to a corner of the Basin Reserve for a special session. "I have been concerned about our bowlers line. They can bring in their variations, but not at the cost of line," Gaekwad said. "Even in the practice game, our bowlers tended to bowl short and they tried quite a few things but it didnt work", said the Indian coach. "They know what they are supposed to be doing here." With the New Zealand camp seeing its best chance in batting out Javagal Srinath and Anil Kumble before attacking the rest to put pressure on the Indians, Harbhajan Singh may be in the picture. It was a sunny day here today with not a hint of wind, indicating that the Basin Reserve strip might prove good for spinners early, rather than on the last two days. While Gaekwad would not give away his team for the Test, a comment regarding VVS Laxman was significant vis-a-vis the contentious second openers berth. "Laxman has had a very good knock in Dunedin and he looked a part but he has been in and out of the team," the coach said. But vice-captain Ajay Jadeja still remains favourite for the slot. The Kiwis are concerned about skipper Stephen Flemings fitness. The home captain, troubled by a niggling groin injury which restricts his movement, took little part in the host teams training and had batted in an open wicket session yesterday without putting himself under any stress. Fleming will, however, play with team physio Mark Harrison having advised him a break in between the current series and a coming home series against South Africa. The Kiwis were however heartened by pace bowler Simon Doulls return to the squad after recovering from a breakdown. Doull will form the home teams pace quartet alongside Chris Cairns, Dion Nash and Geoff Allott. Home coach Steve Rixon took off for Sydney for a short Christmas reunion with his family, but left with a warning to his players not to get carried away by the festive mood and keep their focus on cricket. New Zealand (from): Stephen Fleming (captain), Matthew Horne, Matthew Bell, Nathan Astle, Craig McMillan, Chris Cairns, Adam Parore, Dion Nash, Daniel Vettori, Simon Doull, Geoff Allott, Paul Wiseman. India (from): Mohammad Azharuddin (captain), Navjot Sidhu, VVS Laxman, Ajay Jadeja, Rahul Dravid, Sachin Tendulkar, Saurav Ganguly, Nayan Mongia, Anil Kumble, Javagal Srinath, Venkatesh Prasad, Robin Singh Jr, Harbhajan Singh. CALCUTTA, Dec 24 (UNI)  Cricketer Ajit Agarkar today said that he would not be fit before the middle of next month and that his recent injury was caused by playing too much on the hard surface. Agarkar, who missed the ongoing New Zealand tour because of a stress factor on his left foot, said that very little rest between the matches had also aggravated the situation further. The Mumbai fast bowler who became the fastest to take 50 wickets in one-day international, however, denied that his injury had been caused for not following the changes in bowling action as suggested by Dennis Lillee. "I dont think the injury is caused for not following the changes in bowling action as suggested by Lillee. I feel playing too much on the hard surface with very little rest in between the matches are the causes", he said. Agarkar, who came here as the chief guest in Pepsi school cricket final, agreed that suggestions made by Lillee were just. But it was indeed difficult to adjust to the style at this stage of his career. "I have continued with my present action for five years and it is difficult to change it now." Agarkar said that he would have to wait and take rest till the middle of January next before resuming competitive cricket. He said that it is only after medical consultation in the first week of January that he would be able to know how far he has recovered and when he would be able to go for net again. As to his brief stint in international cricket, Agarkar said that the most vital lesson he learned in international cricket was to be tough mentally. He said: "In international cricket the pressure is quite heavy and one has to be psychologically strong to be successful there." Agarkar said he was lucky enough to start his international career by playing against Australia which were perhaps the toughest team now. Playing against Australia had taught him to be tough mentally, Agarkar added. NEW DELHI, Dec 24 (UNI)  Golden girl Jyotirmoyee Sikdar, who won two gold medals for the country at the just-concluded 13th Asian Games, has been awarded the "most valued performance" (MVP) award. At a felicitation function hosted by South Korean electronic major Samsung here last night, Commerce Minister Rama Krishna Hegde gave the MVP award to Sikdar for her being a multiple gold medallist, displaying consistency in performance and fighting spirit. Sikdar, who had ranked fourth in the 800m and 1500m at the 1994 Hiroshima Asian Games, emerged as the first multiple gold medallist for India since 1986 through her sterling performance at the Bangkok Asiad. A special award was also given to young Dingko Singh who beat world cup silver medallist Sontaya Wongprates and Goodwill champ and World No. 2 Timur Tulyakov to become Indias first boxing winner in 16 years. Felicitating the sportspersons for bringing honour and glory to the country by winning seven gold, eleven silver and 17 bronze, Mr Hegde lauded their effort and achievements and announced that the government will give the Indian Olympic Association (IOA) Rs 25 lakh, which would be distributed among medal winners, coaches and managers. IOA President Suresh Kalmadi said the Bangkok Games witnessed a resurgence of Indian sports, especially in hockey and athletics. Giving away a special award to Indian hockey captain Dhanraj Pillay, Mr Kalmadi said, "Both the mens and womens hockey teams gave a dream performance. We narrowly missed the gold in womens hockey". ROHTAK, Dec 24  Battlelines were drawn for the finals of All India Inter University Boxing Championship on the penultimate day at MDU Sports Complex here today. Boxers belonging to universities situated in North continued to dominate. Out of the 24 finalists in 12 weight categories, 16 belonged to North. Six boxers from the host university, four from Punjabi University, Patiala, three from Kurukshetra and one each from Delhi, Punjab and HAU, Hisar, entered the finals. Feather weight: Jitender Singh (MDU) b Sanjeeva Rao (Kakatia), B. Girdhar (Osmania) b Vikram Tyagi (Kuk). Light weight: Subodh Kumar (MDU) b Naveen Kumar (Allahabad), Arun Kumar (Jamia) b Jagdeep Singh (PU Chd). Light welter weight: Devender Gill (MDU) b Brijesh Kumar (Allahabad), Rohtash Kumar (Kuk) b Vikram Singh (Pbi Uni, Patiala). Welter weight: Ram Rattan (MDU) b Vikky Sharma (PU Chd), Arvinder Singh (Patiala) b Paramjit (GND varsity). Light middle weight: Durjai Shastri (MDU) b Mohammad Ali (Udaipur), Arjun Chauhan (Kuk) b Jagtar Singh (Patiala). Bantam weight: Mohammad Zahid (Calcutta) b Satnam Singh (GND varsity), Ravinder Singh (Nainital) b Kulwant Phogat (Delhi). Fly weight: Ranjit Singh (Patiala) b M.A. Baqi (Osmania), Naveen Dabas (Delhi) b Jadhav Vikas (Pune). Light fly weight: D. Durga Prasad (Osmania) b Ajay Keemta (Nagpur), Anand Kumar (PU Chd) b Mahesh Mawana (GND varsity). Middle weight: K. Sunder (Madras) b K. Gopi (Andhra), Balbir Singh (Patiala) b Darshan Singh (Retired) (Delhi). Light heavy weight: Bhagat Singh (HAU) b Vinod Kumar (MDU), Paramjit Singh (Patiala) b Neeraj Sharma (Retired) (Rajasthan). Heavy weight: Shavetank Pathak (Jaipur) b Aquib (Osmania), Vikram Gautam (MDU) b Bhagwant Singh (Patiala). Super heavy weight: Rajinder (Meerut) b Virender (Gorakhpur), Parender (Kuk) b Aman Awasthi (PU Chd). Kashmir Singh Dhugga, a former US hockey star, will be the manager of the team. Kamaljit Gill, who once led Punjab juniors, is the coach of the team. He will be assisted by Ms Heather Moles of Stanford University, a former US national player. Some of the players have already represented US in various international tournaments, including World Cup, Pan American Games and other events. Nine players belong to Stanford University. The team members are: Jennie Gilbert (captain), Sarah Madeiros, Malika Sawyer, Michelle Scot, Allison Gorelink, Jordyn Kramer, Monique Leroux, Mallory Chambers, Carla Peterson, Kelly Naylor, Debra Orax Robertson, Jenna Graham, Megan Sanssburi and Brenda Lear. The Chief Minister, who was speaking at Ramesh Chander Memorial Hockey Tournament here today, said that Indian men hockey, which has won this unique honour after 32 years, has three players from Punjab, namely Ramandeep Singh, Baljit Dhillon (both Inspectors in Punjab Police) and Baljit Saini. He announced that both the hockey players belonging to Punjab Police will be immediately promoted as DSPs. Besides, the three players will be given Rs 1 lakh each as a reward money. Congratulating the team, Mr Badal appealed to the Indian hockey team to maintain this winning spree. The Chief Minister also announced that flood-lights would be provided at Jalandhar stadium and preparations for organising the National Games will be completed well before time. Mr Badal also announced that the diet money for players will be enhanced from existing Rs 30 per day to Rs 100 per day for all categories from the next financial year adding that a sports hostel in Jalandhar will be constructed. Earlier, the Chief Minister was introduced with the players of Punjab Police and Punjab and Sind Bank. Men: J.S. Cheema, Surjeet Singh Samra, Arunjeet Singh, Surinder Virk, Ravi Kumar, Iqbal Singh, Gurinder Singh, Neeraj Giri Goswami, Piara Singh, Ashok Kumar and Karamjit Singh. Reserves: Kulwant Kumar and Gurpreet Singh. Women: Amrit Kaur, Mandeep Kaur, Bhinder Kaur, Jasbir Kaur, Beant Kaur, Babita, Rupinder Kaur, Sunita, Harpreet Kaur, Rajwinder Kaur, Varinder Pal Kaur and Rajbir Kaur. S.P. Singh and Ram Nath will be the coach and manager, respectively of the men's team while Rashpal Singh and Narinder Kaur will be the coach and manager, respectively of the women's squad. The winner were trailing 0-1 at the ninth minute of the game. Haryana XI equalised through right in Kiran who scooped the ball into the goal in eleventh minute. Eleven minutes later centre forward Simarjit Singh capitalised on the fourth penalty corner to make it 2-1 in favour of the Haryana teams. The winners were leading 2-1 at lemon break. In second half Phagwara team gave a dismal display. Haryana XI missed nine penalty corners in the second half. In the 61st minute Haryana forged ahead full back Suman Bala (international) who made full use of sixth penalty corner of the game. In the next minute left out Sarbjit Kaur reduced the margin from the Phagwara side, who scooped the ball into the goal. Kulwinder Kaur of Phagwara was adjudged 'best player of the match'. CHANDIGARH, Dec 24  Chandigarh senior boys won the gold in rink hockey in the 36th National Roller Skating Championships which concluded at Vishakapatnam recently. Led by Arvind Chaudhury, Chandigarh defeated Jammu and Kashmir by 12 goals to seven in a keenly contested match. While Arvind Chaudhury scored three goals, the other goals for Chandigarh were scored by Anjum Ahmed (five), Abhishek (three) and Parminder (one). Earlier in the semi-finals, Chandigarh got the better of Punjab by seven goals to two. In the women's roller hockey section, Chandigarh girls, captained by Bandeep, finished runners-up, losing to Haryana in the final. In speed skating local girls Randika secured a bronze medal. Mr Jagpal Singh, secretary of the Chandigarh Roller Skating Association, said the association would suitably honour the Chandigarh team at a function to be held shortly. Boys:- Amit Aggarwal (New Public School, Sec 18), Rahul Sharma (Sharda Sarvhitkari, Sec 40), Harpreet Singh (Bhawan Vidyalya, Sec 27), Sumit Grover (Shishu Niketan, Sec 22). Girls:- Ruchika Gupta (Govt. Sr. Sec. School, Sec 19), Manu KC (Govt, Model Sr. Sec. School, Sec 35). Smitha Kapoor (GMSSS-35), Amarpreet Kaur (Manav Mangal School, Sec 21). Mr Tilak Raj and Mr Harish Kumar will accompany the team as coach and manager, respectively. CHANDIGARH, Dec 24 (BOSR)  Anand Chhibber and Sunny Bhalla both had to face some crucial moments before winning their matches in the snooker even on the third day of the Haryana State Billiards and Snooker Championship here today. Anand won in four frames against Gurinder Singh at 66-51, 57-55, 52-59 and 73-37 while Raghav Baweja went down fighting to Sunny Bhalla at 28-37, 34-57, 52-44 and 20-49. In other matches of the day, Raju Sian scored a fine victory over Ravi Baweja at 47-33, 60-34 and 63-33. In junior section, Amit Swamy struggled hard to beat Tarun Malik at 25-50, 53-29, 64-41 and 63-35. In the Billiards section, Rakesh Gupta downed Amit at 375-301. KURUKSHETRA, Dec 24 (FOC)  Both men and women teams of the host Kurukshetra University clinched the All India Inter-Varsity Handball Championship which concluded at Kurukshetra Sports Complex here on Tuesday evening. The host Kurukshetra University men team defeated Panjab University, Chandigarh, by a narrow margin of 21-19 in a thrilling match while the host Kurukshetra University women team defeated Calicut University by 15-14 in an exciting match. CHANDIGARH, Dec 24 (BOSR)  Fine spell of bowling wickets for 8 runs by Saurav helped John's Green beat John's Red by runs in the final of the Edmund Rice Inter House Cricket Tournament today. John's Green: 100 all out in 16.3 overs (Norbert 17, Abhay Mohan 16, Varun 12, Animesh 5 for 7). John's Red: 85 all out in 19.5 overs. (Harjot 29, Param Pratap 13, Saurav Talwar 4 for eight, A. Mohan 3 for 21). CHANDIGARH, Dec 24 (BOSR)  The trials to select the Haryana state junior football team for the under-19 years will be held at Karna Stadium, Karnal, on December 27 at 11 a.m. A coaching camp will also be organised by the Haryana Sports Department at the above venue from December 29 to January 12 next year. The team will thereafter participate in the National Junior Football Championship for Dr BC Roy Trophy to be held at Imphal (Manipur) from January 17 next year. Boys: 100 Mtr: Mohinder 1, Sobat 2. 200 Mtr. Sobat 1, Nitesh 2. Discus Throw: Akram 1, Balwinder 2. Shot Put: Vinay 1, Randhir Singh 2. High Jump: Sonu 1, Pardeep Kumar 2. Girls: 100 Mtr: Kiran Negi 1, Meena 2. 200 Mtr. Kiran 1, Aradhana 2. Discus Throw: Pratibha 1, Narinder 2. Shot Put: Parminder Kaur 1, Pratibha 2. High Jump: Kiran Negi 1, Janki 2. YAMUNANAGAR, Dec 24 (FOC)  In the All-India Ballarpur Industries Football Tournament at Thapar ground, Punjab Police Jalandhar defeated Jammu & Kashmir Bank by 1-0 in the first leg semifinal. Khushwant Singh of Punjab Police Jalandhar scored the winning goal. Other semi-final between Punjab State Electricity Board, Hoshiarpur and Border Security Force, Jalandhar ended in goalless draw.